Bharatiya Vidya Bhavan known for its culture and heritage has organized prestigious 11th Tirupati Book Festival from 11th to 19th February, 2017 at S.V. High School Playgrounds, Tirupati. 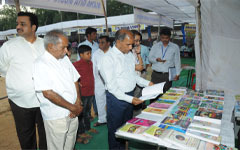 60 publishers from all parts of India had put up more than 82 stalls with books in Telugu, English, Hindi, Sanskrit etc.,. Renowned publications like Tirumala Tirupati Devastanams (T.T.D. 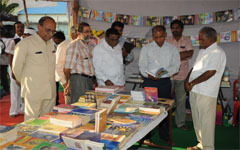 ), E.M.E.S.C.O., Book Wala, Scholastic, Bharatiya Vidya Bhavan etc., showcased their best sellers in the book fair. Various books like Spirituality, Science and Technology, Fiction, Cooking, Interior Designing, Architecture, Comics, Puzzles etc., were available. On 11th February, The procession of Holy Scriptures like the Ramayana, the Mahabharatha and the Srimad Bhagavat Gita were taken in a palanquin from the Mahathi Auditorium to the venue. The festival was inaugurated by the Chief Guest Dr D. Sambasiva Rao, I.A.S., Executive Officer, T.T.D., and Chairman, Bharatiya Vidya Bhavan, Tirupati Kendra. In his Welcome Address, Dr Alladi Mohan, Executive Committee Member, Bharatiya Vidya Bhavan, Tirupati Kendra welcomed all the dignitaries on the dais. 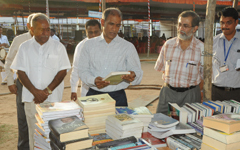 Dr N. Satyanarayana Raju, Convener of the Book Festival and Hon. 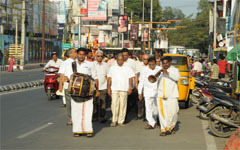 Director & Treasurer, Bharatiya Vidya Bhavan, Tirupati Kendra, in his presidential address said that Sri Bhagavad Ramanuja’s 1000th Birth Anniversary was focused to bring awareness among the public as the Temple Town of Tirupati is famous today due to the contribution and devotion of the spiritual socialist, Sri Ramanujacharya. Similarly, Swami Vivekananda Virtual Library has been organized to inspire the youth to be patriotic and preserve India’s culture and tradition. Speaking on this occasion, Dr D. Sambasiva Rao said that, Tirupati is an educational hub and such book festivals help in enriching libraries and students knowledge. He also said that T.T.D’s contribution to make spiritual books is available online and advised people to embrace the technology. Prof. P. Murali, Former Vice-Chancellor, S.V. University, Tirupati and Executive Committee Member, Bharatiya Vidya Bhavan, Tirupati Kendra, thanked T.T.D. for extending help every year for the growth of Book Festival. The Day’s Guest of Honour Dr Medasani Mohan, Special Officer, Telugu Bhakthi Vangmaya Project, T.T.D., Tirupati, emphasized that man has many duties and reading good books is one among them. Relating a few experiences, he said that reading good books disciplines one’s mind and soul and also empowers a person. The Guests were felicitated by the Executive Committee Members of Bharatiya Vidya Bhavan, Tirupati Kendra. The programme concluded with the Vote of Thanks by Prof. P. Sudhakara Reddy, Secretary, Bharatiya Vidya Bhavan, Tirupati Kendra. The programme was attended by Shri R.V. Jagga Rao, Retd. Engineer, T.T.D., Tirupati, Shri P.V. Krishna Reddy, Executive Vice-Chairman, Bharatiya Vidya Bhavan, Tirupati Kendra; Shri P. Sudasarnam Raju, Prof. Ch. Govinda Raju, Executive Committee Members, Bharatiya Vidya Bhavan, Tirupati Kendra; Prof. Srikanth Reddy and Bhavan’s S.V. Vidyalaya staff. On 18th February, Shri Tanikella Bharani, Renowned Writer and Cine Artist and Swami Anupamanandaji, Secretary, Ramakrishna Matt, Tirupati brought grandeur with their presence to the eighth day of the 11th Tirupati Book Festival. Speaking on the occasion, the day’s Chief Guest Shri Tanikella Bharani in his address appreciated Bharatiya Vidya Bhavan and Ramakrishna Mission for extending the relentless service in upholding the values, culture and spiritualism. He expressed his grief by saying that the youth today is not focusing on literature which is eternal and appealed them to read the biographies of famous personalities and quoted some of the influential books authored by renowned writers. Guest Speaker Swami Anupamanandaji in his address highlighted some of the inspirational quotes of Swami Vivekananda and added that Swami Vivekananda is the symbol of eternal youth and his life itself is a message to the youth. Shri P.V. 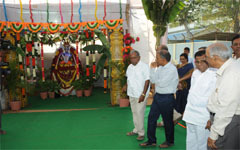 Krishna Reddy, Executive Vice-Chairman, Bharatiya Vidya Bhavan, Tirupati Kendra presided over the function. 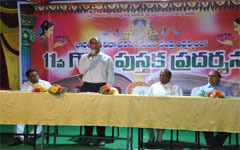 He said that it’s a great opportunity for the present youth and public of Tirupati to select good books. The day’s Chief Guest Prof. A. Damodaram, Vice-Chancellor, Sri Venkateswara University, Tirupati expressed that books play a significant role in everyday life and they are good friends packed with knowledge. He also said that Indians stand top most in reading books. The day’s Guest of Honour Vachaspathi Samudrala Lakshmanaiah, Special Officer, Purana Ithihasa Project, T.T.D., Tirupati opined that the 9-day Book Festival was Gnana Yagna to promote knowledge. He advised the people to preserve books, read them and understand. Shri J. Prabhakara Rao, I.P.S., D.I.G., Ananthapur Range, in his address he stated that the present youth to read more books along with academic books. He advised to read printed books rather than e-books. He expressed that youth need to be more determined to read book. Dr N. Satyanarayana Raju, Hon. Director & Treasurer of Bharatiya Vidya Bhavan, Tirupati in his address, he mentioned that 21st Century, our country can evolve as a great Nation only through book reading. He declared that the 12th Tirupati Book Festival will be held from 3rd February, 2018 to 11th February, 2018. Prizes were distributed for the winners of various competitions held during the book festival. Bhavan’s Tirupati Kendra committee members, Principal, Sr. Vice Principal, Staff and denizens of Tirupati, book lovers attend the function with great enthusiasm.